`Ingredients are at the heart of everything we do at River Cottage. By gathering our all-time favourites together, I hope to inspire you to look at them with fresh eyes and discover new ways of cooking them' Hugh Fearnley-Whittingstall The definitive River Cottage kitchen companion. Hugh Fearnley-Whittingstall and his team of experts have between them an unprecedented breadth of culinary expertise on subjects that range from fishing and foraging to bread-making, preserving, cheese-making and much more. In this volume they profile their best-loved and most-used ingredients. 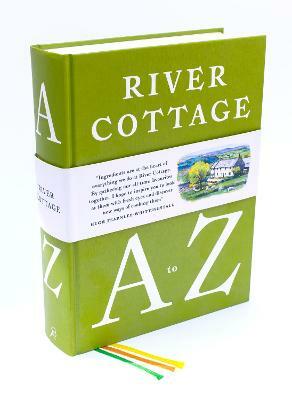 With more than three hundred entries covering vegetables, fruits, herbs, spices, meat, fish, fungi, foraged foods, pulses, grains, dairy, oils and vinegars, the River Cottage A to Z is a compendium of all the ingredients the resourceful modern cook might want to use in their kitchen. Each ingredient is accompanied by a delicious, simple recipe or two: there are new twists on old favourites, such as cockle and chard rarebit, North African shepherd's pie, pigeon breasts with sloe gin gravy, or damson ripple parfait, as well as inspiring ideas for less familiar ingredients, like dahl with crispy seaweed or rowan toffee. And there are recipes for all seasons: wild garlic fritters in spring; cherry, thyme and marzipan muffins for summer; an autumnal salad of venison, apple, celeriac and hazelnuts; a hearty winter warmer of ale-braised ox cheeks with parsnips. With more than 350 recipes, and brimming with advice on processes such as curing bacon and making yoghurt, the secret of perfect crackling and which apple varieties to choose for a stand-out crumble, as well as sourcing the most sustainable ingredients, this is an essential guide to cooking, eating and living well. More than anything, the River Cottage A to Z is a celebration of the amazing spectrum of produce that surrounds us - all brought to life by Simon Wheeler's atmospheric photography, and Michael Frith's evocative watercolour illustrations.